Under the Big Oak Tree: I'm going to lose it! Now we're getting somewhere! I'm going to lose it! Now we're getting somewhere! Yesterday completed my second full week following Weight Watchers Online. 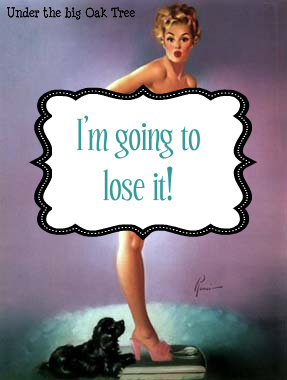 I am so happy to report a loss of 2.6 lbs this week! For a total of 7 lbs since I began "dieting" in July! I finally feel like I am getting somewhere! I still have to log in my points from the weekend, and I think I may have possibly gone over my weekly points, but I do feel as if I did much better with the points than the first week. I still had some trouble getting in all of the Good Health Guidelines (water, veggies, multivitamin) but at week 2 of following the plan, I am doing much better than I've done in weeks months YEARS! I'll have to continue working on my Good Health Guidelines. Last week, after mentioning that vitamins make me sick, I received a couple of comments suggesting that I take them before bed. So, once I get Grace back on schedule, that's exactly what I'll do. Thanks so much for the suggestion, ladies! Dinner time has been a bit of a challenge to me these past couple of weeks. I didn't mind measuring and weighing my food when I followed the program years ago. But now, it seems a bit time consuming. While trying to get dinner on the table for us, making sure there is something that Grace will eat, putting down the dog's food, it seems like forever before I get to sit down to eat. And usually when I do, Grace needs help with her food in some way. Sometimes if there are leftovers, I will measure a portion or two for myself into separate containers so that on "leftover night" I can just heat up my pre-measured portion. This makes it easy since I'll know what the points value is from the first night. Breakfast and lunch are a bit easier. I still measure or weigh my food for those meals, but since we're not all sitting down at once for dinner it doesn't seem as time consuming. I tend to eat the same few things throughout the week for breakfast and lunch. It's just easier that way for now. In future weeks, I'll get into more detail about the foods I am eating and hopefully that will be a help to any of you that are trying to lose some extra pounds. I'll also be sharing some healthy recipes as I try them. I have a really great recipe to share this week, so be sure to check back! Also, be sure to check out "Hot To" Homemaker and her "How To" Healthy Living series. Now that's the best news I have heard all day!! WAHOOOOOOOOOOOOOOO I am so proud of you!!! 2.6!!!! Yippee!!!! That is wonderful and great job!!!! I can't wait to hear this week's loss. I completely understand about the tiime it takes to weigh and measure food. I have to do it for both Mike and I and it is so tempting to just eyeball it. Eyeballing is not a good thing for me to do right now.